When designer Malan Breton ended his 2011 Fall Collection with the OUI for MATTISON by Malan Breton red wedding gown, we knew brides would love it. But if you are wondering if you could wear it down the aisle the answer is clearly "Yes". 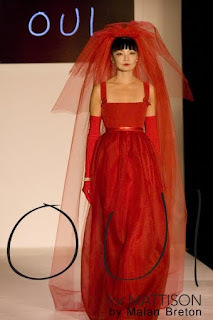 Wearing a Red Wedding Dress would be reclaiming the origin and tradition of the wedding dress. Throughout the ages, Red was the traditional wedding dress color. Red is the color of good luck and auspiciousness. White was never even considered until 1840 when Queen Victoria had a white wedding gown made to incorporate some white lace she owned. Wanting to be like the Queen, women soon adopted the White Wedding Gown. Roman brides wore fiery red veils. Today, Greek, Albanian and Armenian brides wear red veils. Chinese brides wear red wedding gowns and are carried to the ceremony in a red litter. Then the bride walks on a red carpet and is greeted by the groom who lifts her red veil. In ancient Russia people also loved the color red which symbolized joy, sun and beauty by wearing a red color sundress. Roman brides wore red to protect themselves from evil. Brides in the middle ages wore red as a mark of the high status and many Indian brides still hold to this tradition. Chinese brides still wear red on their wedding day as a expression of good luck. The Red wedding dress, is not a departure from the traditional. It is a return to the origins of the wedding gown. 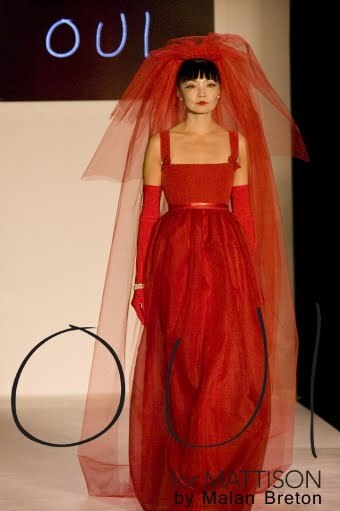 Luxurious Wedding Recommends... OUI for MATTISON by Malan Breton's red wedding gown for the 2011 bride. The OUI for MATTISON wedding gown is also available as a bridesmaid's dress and both can be custom ordered in an array of colors. For more information on the OUI for MATTISON by Malan Breton wedding gown contact Deborah L. Lynch at the MattisonNetwork.